March 11, 2004. The Madrid 3/11 Bombings: Was it Really an Attack by “Islamic Terrorists”? A series of bombings plunged Madrid into mourning five years ago. The Spanish legal system concluded that this operation, attributed first to ETA and then to Al Qaeda, was Islamist inspired, though not linked with international networks. The Spanish press, led by the newspaper El Mundo, today is calling into question that conclusion, which was of obvious political character. As in the cases of the September 11th attacks in the U.S., or those in Bali, Casablanca and London, we will take a look at an analysis of the issue. 192 dead and 1,800 injured. The Madrid attack represents an authentic trauma for Spanish society, above all because the controversy over the real perpetrators of the attack has not yet ended. On March 11, 2004, around 7:40 in the morning, ten bombs exploded on four trains in the space of a few minutes. The date appears to have been carefully selected because the events took place just three days before the general elections in which the People’s Party (of the political right) of outgoing President José María Aznar was presented as the favorite. The suspicions of the press and of the majority of Spaniards turned immediately to ETA, the Basque nationalist group, against which the outgoing prime minister had preached a policy of force. But with the arrest of a group of Moroccan suspects on the eve of elections, the suspicions of the public were redirected towards al Qaeda. The attack might have been in retaliation for Spain’s participation in the war against Iraq, although autopsies showed that it had not been a suicide attack. The subsequent insistence of the Aznar government in condemning ETA was interpreted as the result of a campaign calculation and in the elections of March 14 victory went to the Socialist Party of Jose Luis Zapatero. Three weeks later, on April 3, seven North African suspects ’committed suicide’ by blowing up the apartment in which they had been surrounded by police. The investigative proceedings then lasted more than two years until the opening of the trial for the bombings in February 2007. The courts upheld the theory of an Islamist attack but the alleged organizers of the attack were acquitted. Only one defendant was found guilty of having planted bombs on the trains and most of the 29 defendants were convicted of being members of Jihadist groups, not for being involved in the attack. The appeals trial upheld that ruling in July 2008. In Spain, an intense controversy continues even now around the attack, designated as “11-M”. The foreign press has essentially abstained from reporting the polarization of the Spanish media on the topic . Spain’s two main newspapers, in fact, take starkly opposing view points when addressing the terrorist attacks of March 11. According to El Pais (center-left Atlanticist newspaper), there are no legitimate doubts about the Islamist theory, while for El Mundo (center-right nationalist newspaper) the Islamist theory is nothing more than a police set-up. The journalist most representative of the advocates of this nationalist view is undoubtedly Luis del Pino, who works for Libertad Digital, the leading online newspaper in Spain, and also the author of several books and documentaries on the subject for TeleMadrid . Other media, more willing to try to discredit than to initiate a rational debate, consider the position of Luis del Pino a conspiracy theory or “consparanoia”. Division exists even among skeptics who oppose the theory of an Islamist attack. Some incriminate ETA while others suspect the secret services of Spain as well as of foreign nations. Our article does not take up the issue of the real perpetrators of the attack but rather is limited to showing that the official version is false. Given that the Spanish justice system has endorsed the theory of an Islamist attack, it is essential to begin by laying out this theory. As incredible as it may seem, the evidence that supposedly confirms the theory can not stand up to rigorous analysis. And the suspicious behavior of certain elements of the police forces clearly indicates the existence of an intent to sabotage the investigation. All the information contained in this article comes from the Spanish media cited above and from official court documents, such as the indictment, hearings from the trial, and the verdict. The theory of an Islamist attack is the final conclusion of an investigation that developed out of two tracks. We will present here the progress of that investigation, emphasizing the evidence accepted by the Spanish courts . The first track of the investigation begins with a bomb that did not explode. Three of the bombs placed in the trains were defective and failed to explode. So very soon after the attack, it was known that the bombs had been concealed in bags or backpacks. On the morning of March 11th, explosives specialists neutralized two of them by controlled explosions. But no one noticed the third backpack and it was set aside with the victims’ possessions. It was upon inventorying these possessions that the backpack containing the bomb was found, in the police station of suburban Vallecas during the night of March 11th and 12th. That bomb, known as “the Vallecas backpack”, consisted of 10 kilograms of “Goma-2 Eco” dynamite, shrapnel, a detonator and a cell phone that should have triggered the explosion via its alarm setting. The phone contained a SIM card which, when it was tracked through the sales network, made it possible to determine where it had been sold. The tracking led to a telephone store in Madrid belonging to a Moroccan, Jamal Zougam. Based on those elements, the police arrested Zougam, two of his employees and two Indians who had allegedly sold the phone. Those arrests came on March 13, the eve of the elections. The media announced the arrests and gave wide coverage to photos of the suspects. During the following days, several passengers on the metro said they had seen the detainees on the bombed trains. Finally, the inconsistency of the testimonies led to the release of four of the five suspects several weeks later. Zougam remained in prison because the testimonies against him seemed more solid. The other track that serves as a starting point for the investigation are revelations by Rafa Zouhier, a petty drug dealer from Morroco and an informant for the Guardia Civil (the second largest police force in Spain) . A few days after the attack this individual told police in a taped telephone conversation that he harbored strong suspicions about a man named Jamal Ahmidan, alias “El Chino”. El Chino is another Moroccan petty drug dealer and Zouhier had put him in contact with a gang from Asturias (a region of northern Spain) suspected of smuggling, among other things, explosives originally intended for mining activities. One member of that gang, Emilio Trashorras, confirmed to the police that he had provided El Chino with Goma-2 Eco explosives, an assertion corroborated by a young gypsy who participated in the transaction. Moreover, communications among various members of El Chino’s gang were being intercepted as part of an investigation into drug trafficking, and the recordings confirm that the persons concerned had traveled to Asturias. The two tracks of investigation lead to completely different individuals. On one hand, Zougam, and on the other, El Chino and his gang. No personal links have been found between the two. The only connection comes from seven SIM cards whose numbers appear during tracking of phone marketing networks. And they are connected to El Chino because the telephone carrier Amena said that the cards were activated for the first time the day before the attack in the antenna reception area that covers El Chino’s house. Apparently, the explosives were found in that house and the bomb preparation took place in that same location. No activity was ever generated from the seven SIM cards after their activation, which seems to indicate that they might have been used to detonate the bombs. This is how the link was established between Zougam and El Chino’s gang. Around noon on April 3, three weeks after the bombing, police finally located El Chino’s gang in an apartment in Leganés outside Madrid. Upon discovering the presence of the police, the suspects refused to surrender and opened fire. At the end of the day, the GEO (Special Operations Group of the Spanish police) launched an assault to try to capture the members of the terrorist group. The intelligence services warned the police that the besieged suspects had made several telephone calls in which they announced their intent to commit suicide. The police forced open the apartment door and an explosion occurred that killed the 7 suspects and a GEO police officer. Amid the rubble of the apartment were found Goma-2 Eco explosives, some documents and a video claiming responsibility for the attack, but the people featured in the video were not identifiable due to masks they were wearing. Like El Chino, most of the seven dead were petty drug dealers. The rest were members of radical Islamist circles. The trial sentence concluded that these people set the bombs, with the participation of Zougam, and planned to commit other attacks in the region of Granada, where they had rented an apartment. A certain amount of secondary evidence supports the conclusions of that investigation. Among the exhibits is a Renault Kangoo van which was the first important element found during the investigation and its discovery led to numerous controversies. This vehicle was discovered in the parking lot of the Alcala subway station, where all the trains that exploded had passed on March 11. An attendant in the neighborhood said that on the morning of March 11 he had seen three suspicious individuals loitering around the Kangoo. They were essentially masked with scarves and hats and one of them walked to the subway station carrying a bag. Towards the end of the morning, the police opened the van and inspected it. Two dogs trained to detect explosives checked the Kangoo without finding anything suspicious. Upon discovering that it was on a list of stolen vehicles, the van was taken to a police location. There, after a new inspection, 7 detonators appeared in the van, along with a fragment of Goma-2 Eco explosive wrapped up under a seat and, most importantly, an audio cassette with a recording of the Koran, which would have a decisive impact on Spanish public opinion. The trial verdict concluded that the objective of the terrorist group was to impose Islamic law in Europe by force and that the group was inspired by Al Qaeda, while not being actually linked to that organization . We have just presented here all the important pieces of evidence that served as the basis of the Islamist attack theory. All, nevertheless, are plagued by suspect elements, as we will see as we analyze them again one by one. The primary physical evidence relates to one of the bombs that did not explode on March 11 — the one that appeared in the backpack in Vallecas. Serious suspicions of fabrication exist, however, with regards to its composition and with regard to the circumstances in which the discovery occurred. In the first place, the bomb did not explode because of a cable that simply was not connected. The explosives expert in charge of deactivating it testified in court that this “shoddy piece of work” did not match the complexity of the rest of the device . There is also an essential difference between the composition of this bomb and those that did explode. The Vallecas backpack contained 640 grams of screws and nails intended to serve as shrapnel. However, autopsies revealed that none of the victims had been struck by metal projectiles . And, according to the police who handled them, the two bombs defused on the morning of March 11 contained no such projectiles. What motivated the terrorists to put shrapnel in just one of the bombs? And finally, the circumstances of the discovery of the Vallecas backpack are unclear. During the trial, explosives experts explained that they had searched all the objects left in the train cars four times and confirmed that it was impossible that the found bomb had been among them . Its origin is even more doubtful because the abandoned objects, among which the bomb was purportedly found, were moved 3 times throughout the day of March 11, not always under the best surveillance , and ended up at the Vallecas police station, contrary to what the judge had ordered. If one adds to this the conflicting testimony about when it was discovered , the fact that the bomb was not mentioned in the inventories of abandoned objects , and the fact that there are no photos of the bomb before the time that it was dismantled, the inconsistency of such evidence becomes clear. Notwithstanding all this, the court used it as a key element in rendering its verdict. The investigation into the telephone marketing network concluded that the SIM card found in the backpack in Vallecas had been on sale in Zougam’s store. On what was the investigation based to reach that conclusion? Before their sale to a customer in a store, SIM cards usually pass through the hands of three or four intermediaries. But only the initial brokers list on their invoices the identification number of each SIM card sold. Subsequent brokers only record the total number of SIM cards. In this case, there is no invoice showing that the SIM card in question was sold to Zougam . The only thing that allows one to reach that conclusion is the testimony of his supplier, who says he remembers specifically the sale of that SIM card among hundreds of other cards. Let us accept, nevertheless, that fact as sufficient proof and continue examining the course of the investigation. The fact of having sold a SIM card does not make the seller responsible for any possible criminal use that the buyer might make of that card. But Zougam had appeared as a witness in a previous investigation about Islamist terrorists. It would seem that was the only motive for his arrest on March 13, given that no witness had described him nor had identified him before that date. A re-analysis of Zougam’s behavior up until his arrest shows that apparently he committed a series of truly incredible indiscretions. In the first place, he used a SIM card on sale in his own store to make the Vallecas bomb. Secondly, he left that SIM card in the phone even though it was not necessary to use its alarm clock function. And, thirdly, he continued his normal activity until the day of his arrest on the afternoon of March 13, despite the fact that all of Spain had known since the morning of March 12 that police had dismantled one of the bombs. From that moment on, Zougam had to know that the investigators were in possession of a SIM card that would lead to him. But he did not try to hide or flee. The incoherence of that behavior leads to doubts about his guilt. The media gave wide publicity to the arrests of March 13 and to photos of the suspects. Passengers from the attacked trains spontaneously showed up to testify about the suspects seen on trains on March 11. Some of these testimonies implicate Zougam and constitute the only evidence of his involvement in the attack. There is also in this case an incredibly inconsistent piece of evidence, in relation to the seriousness of the facts. The first problem is the spreading of Zougam’s picture across the media, thereby preventing testimonies from complying with a fundamental rule: memory must not be influenced by other images seen after the events. Moreover, some witnesses did not agree as to the trip that Zougam allegedly made on the trains, with contradictions regarding his description, how he was dressed or stating that he placed a bag in a place where no bomb exploded . Finally the verdict of October 2007 only takes into account 3 testimonies incriminating Zougam . In the appeals trial of July 2008, the court invalidated one of those 3 testimonies because the witness had given his statement to the investigative judge rather than before the court, where he had not even been convoked, a fact which prevented Zougam’s defense from questioning him despite already existing doubts about his statement. For example, according to that witness, the suspect got off the train, onto the platform, and then returned to the same train car through the door that connected to the other car, all strangely indiscreet behavior for someone who is planting bombs. There are, therefore, only two statements accusing Zougam and these come from two Romanian friends who were traveling together. The first came forward as a witness three weeks after the bombings. At that moment her description of the suspect is very brief: a person 1 meter 80 centimeters tall, of average build, and carrying a handbag. Without further details. But that same description becomes more precise days later when the police show her a series of photos among which she recognizes Zougam: shoulder-length hair, a rather thick nose, a goatee, lower lip thicker than upper, etc. It is reasonable to ask then if what this witness is describing is what she saw in the photograph rather than what she remembered. In addition, her statements continued to change with regard to other details, such as the position of the car in the train. After a year, the witness recalled that the suspect had pushed her, justifying in that way why she remembered his face, and then saying for the first time that she was traveling with a friend, who thus became the second accusing witness against Zougam. Why did a whole year pass without her mentioning the friend who was traveling with her? Why did that other witness wait a year before coming forward? What could this new witness still remember after all this time? Can her testimony be considered as independent of that of her friend? And it is precisely on the basis of these two dubious declarations that the only guilty finding for the carrying out of the bombings on March 11 was reached. For his part, Zougam always denied any involvement in the bombings. All the others who allegedly planted bombs on April 3 died in the explosion of the Leganés apartment, three weeks after the attacks. An important consequence of the deaths of these individuals is that the investigation did not reconstruct the exact role of each one in the carrying out the attack, thus focusing attention on those accused. The court acknowledged in its ruling that it ignored which of these 7 individuals were involved in placing the bombings and where they did it . This contrasts with the case of Zougam, clearly accused of having placed the bombs on the train that exploded at the Santa Eugenia station. Considering the difficulties involved in maintaining the records of the accusation against Zougam, one might think that the lack of information [about the people killed in Leganés] was paradoxically beneficial to those attempting to prove the guilt of those 7 suspects since it avoided any contradiction with reality. The investigation then focused on demonstrating that the death of those in the Leganés apartment was a suicide, a suicide that was used as proof of the fanaticism of the suspects, while the discovery of documents which claimed responsibility for the attack among the ruins of the apartment was interpreted as a posthumous confession. The circumstances under which that apartment was discovered, just at the time when the 7 suspects were inside, remain unclear. For a long time, the police spoke of a shootout in the street between several of its officers and a gang of North Africans. The incident allegedly resulted in a chase that led the gang to take refuge in the apartment in Leganés . But this episode later disappears from the official version to make way for another explanation. According to this version, the police reviewed the list of calls from a suspect phone belonging to the terrorist cell. By calling one of the numbers on that list, the police made contact with a property owner who claimed to have rented an apartment in Leganés to a group of Arabs about a month prior. That is the version of the apartment’s discovery mentioned in the verdict, in which the story of the chase is totally ignored. The police then surrounded the apartment on the afternoon of April 3. Around 9 PM, the GEO began the assault in a hasty manner, according to members of that group . But before gaining entrance, the apartment blew up, killing its 7 occupants and a GEO member. Due to the condition of the bodies, it was necessary to use fingerprints or DNA during the identification process. The investigation concluded that it was a group suicide, but the suicidal nature of the explosion was not as clearly established as verdict stated. Before the assault by the GEO and the explosion, neighbors had heard gunshots, shouting and even Arabic chants coming from the apartment. But no one clearly saw the suspects. And there were no fingerprints or any sign of bullet impacts that should exist there after an exchange of gunfire . The decisive argument supporting the theory of suicide is that the suspects allegedly had communicated by telephone with their families during the siege to say goodbye. During the trial, the only family member called as a witness to those phone calls was the brother of one of the 7 suspects, Abdenabi Kounjaa. This witness testified that he could not recognize the voice of his brother during the call, and that he did not think it was him , which is why he immediately alerted the police and did not call back to convince his brother not to commit suicide. That testimony casts serious doubt on the authenticity of the calls, especially if one considers that no other family was summoned to the trial as a witness. The investigative file contains 3 successive reports on those calls, but provides no further clarification of the matter. Each report contradicts the previous one in various aspects: the phones used, the identity of certain recipients of calls, and the number of calls made to some recipients . So many differences justify doubts about the reliability of such information. Did the suspects really commit suicide? What circumstances brought about the presence of those individuals in that apartment? By April 3 the media had already been announcing for 4 days that they were being sought and their pictures had already been disclosed. In that context, for all of them to meet in an apartment outside Madrid, instead of escaping each by his own means, was extremely imprudent. And why would these criminals, who had just committed a massive crime, wait for the police to evacuate the entire neighborhood before blowing up their apartment? The inconsistencies do not end there. Anyone interested in the movements of suspects from the time of the attack to the moment of their suicide will learn, for example, that El Chino was partying with his wife’s family 8 days after the attack, in the same house where he allegedly built the bombs. The very profile of most of the members of the cell does not correspond to a radical Islam that allegedly led them to perpetrate the massacre and later to commit suicide. Four of them were petty criminals linked to the world of drug trafficking, a fact not very compatible with Islam. El Chino lived with a native Spaniard, who wore flimsy clothes, and their son went to Catholic school . The death of the other 7 suspects allowed, in any case, the reconstruction of a scenario without going into too much detail, and without the accused being able to contradict it. Moreover, journalists who have had access to the investigative file  have cast doubt on the above connection and between the 7 suicides and Zougam. According to these journalists, there is nothing in the documents provided by the phone company Amena to indicate that the seven SIM cards in question had been put into use at the home of El Chino. The defense brought up that problem during the trial without the Amena employees who had been invited to testify as experts responding to it . The last major element in favor of the Islamist attack theory is the Renault Kangoo van. The verdict stated that several members of the terrorist cell, without specifying exactly who , used the van to arrive at the subway with their bombs. Therefore, the court did not take into account the evidence given — during the trial itself — by the dog handler who participated in the inspection of that vehicle. In effect, although the dog handler recognized the possibility of a small piece of explosive being overlooked, that same expert stated that the handling of bags with dozens of kilograms of explosives would have left a trace of odor inside the vehicle, traces that his dog would have detected . Question from Zougam’s defense attorney: “In the event that the van had been transporting 50 or 30 kilos of explosives, would the dog have detected that smell? — Yes, he would have detected it, he would have immediately, because explosive residues remain and the dog would have detected it.” ( (En el caso de que en esa furgoneta se hubieran transportado 50 o 30 Kilos de explosivo ¿El perro habría detectado ese olor ?- Si lo habría detectado, inmediatamente lo habría, porque quedan residuos del explosivo y el perro lo habría detectado.) Then another lawyer asked whether the dog would have detected the smell if the explosive would have been particularly well packaged. The witness replied that the handling of such a large amount of explosive always leaves a smell.]]. Furthermore, the attendant who brought the Kangoo van to the attention of the police stated that he thought the individuals were Eastern Europeans, and the metro station employee who sold a ticket to one of the individuals claimed he spoke without an accent . Regarding this point, once again the behavior of the suspects is surprising. Why attract attention by turning to the ticket saleswoman with their faces almost masked instead of buying the ticket at a vending machine? Why run the risks of using a stolen vehicle without changing the license plates? And why did the terrorists abandon that vehicle, in particular leaving detonators, explosives and clothing inside it? According to the indictment, that clothing contained DNA samples of suspects, but the verdict did not take into account that evidence. So many unexplained aspects of the supporting evidence cause the Islamist attack theory to lose all credibility. This is especially so considering that this article does not mention all of them. In his book Les Dessous du Terrorisme , Gerhard Wisnewski shows, for example, the inconsistency in the various Islamist claims of responsibility for the attack. In accepting the thesis of Islamist responsibility, the Spanish court concluded to a surprising extent that these contradictions were not significant. Is there other evidence to support the theory of an Islamist attack or to steer the investigation in another direction? The problem is that key elements of the investigation have been neglected in a manner that is, to say the least, disturbing. First, the train cars where the bombs exploded were destroyed just two days after the attack . Why was it necessary to eliminate the “crime scene” so quickly? In 2006, a subway train that had suffered an accident in Valencia was kept for 2 years because of the needs of the investigation. The court acknowledged in its ruling that answers would have been found to address many doubts if the coaches had been preserved for a longer time . The most important of those doubts has to do with the nature of the explosive used. The analysis of the chemicals deposited on the objects located near the explosions would have provided key information for the investigation. However, no one knows yet exactly what it was that exploded on the trains, as was acknowledged in the verdict . We see here why it was not possible to determine the type of explosive used. The first was negligence in selecting the agency that performed the analysis of the samples. The responsibility for that analysis was put into the hands of bomb disposal specialists, whose laboratories have only rudimentary methods for analysis of explosive substances. Under usual procedure, forensic police would have had to ensure the analysis, precisely because they have far more advanced methods. The results of the forensic analysis were also very imprecise. The report submitted to the investigative judge indicated the presence of “generic components of dynamite” in the samples. But it does not specify the type of dynamite. Was it Titadyne, Goma-2 Eco? Even more surprisingly, it does not even include the list of chemical components found. Faced with so much uncertainty, the court ended up ordering a new expert analysis at the time the trial began in 2007. Unfortunately, the new expert analysis had to use the already analyzed samples, since they could not collect new samples due to the previously mentioned destruction of the trains. The experts complained about the small number of samples kept by police and the contamination of these samples due to serious negligence in the course of the previous analysis . Finally, their findings do not shed more light on the type of explosive used given that those findings include a list of products that do not correspond to the makeup of TNT . At the end of this whole process, there was great interest in the anticipated testimony of the director of the laboratory of bomb deactivation specialists to answer questions about the work she had delivered in March 2004. But she testified that she did not have the chromatography media in which the chemical elements appeared , nor did she even have the documents in which they had made notes during the carrying out of their analysis . Nevertheless she shocked the court when she recited for the first time the precise listing of chemical compounds found, explaining that she had never turned over that list because no one had explicitly asked for it . The imprecision of the analysis report had led to such a huge controversy in Spain during the 3 years between the attack and the testimony of the director of the laboratory that her explanation was laughable. What credence can be given to that list, first mentioned after 3 years and which corresponds to the composition of Goma-2 Eco dynamite? To the question of the explosives must be added the doubts that led to the statements of the chief of the bomb-dismantling specialists who oversaw operations on March 11. Upon seeing the damage the bombs had caused, the chief of the specialists stated that visible tearing of the structures of the train cars was characteristic of high power explosives, of a military type, not of dynamite . It is important to remember that certain military explosives leave no chemical traces at the scene of an explosion, which make them very difficult to detect. Another source of doubt is the location of the bombs as reconstructed in the indictment . According to that document, most of the bags, which contained 10 kilograms of explosives, were not hidden but, for example, had been left between two front seats situated face to face next to a window, or in the baggage area, or beside the trash receptacle, or under a folding seat (which should have closed). Only one bomb was hidden under a non-folding seat. Why didn’t the terrorists try to better hide the handbags? And how is it possible that such heavy bags, abandoned in such visible places, did not attract the attention of the passengers? To answer these questions, several journalists expressed the hypothesis that the bombs were very much smaller and made not with dynamite but rather with high-powered explosives . The Goma-2 Eco dynamite found in the Kangoo van, in the Vallecas backpack, and in the Leganes apartment does not prove that the same explosive was used to blow up the trains. The suspicions about these facts suggest that these were items intended to divert attention from the crime scene, in other words, away from the trains. A final example of negligence: the recordings of conversations among police patrols would have helped to clarify the issue of the chase that allegedly took place in Leganés. But when the judge asked for these recordings, the police said they had not been preserved . More serious than these acts of negligence is the existence of strong suspicions of falsification of various elements of the investigation. We have already mentioned the Vallecas backpack, the Kangoo van and the goodbye phone calls by the Leganés suicides. But there are other elements whose fabrication is so obvious that not even the verdict took them into account, such as, for example, the telephone conversations of Rabei Osman, an Egyptian who lived in Italy. Italian police recorded and translated his conversations in 2004, and in one of them this individual allegedly takes responsibility for organizing the attacks. During the trial, new translations requested by the defense showed that the sentences in which Osman takes credit for organizing the attack were simply invented by the Italian translators . The Spanish court was therefore obliged to absolve him of all ties to the attack, after he had been presented as the brains of the Islamist group. The verdict does not name an organizer of the attack, a fact which provoked the indignation of victims’ associations, who filed an appeal. But the most notorious fabrication of the investigation is a Skoda Fabia car that police found near the Alcala metro station, 20 meters from where the Kangoo van was found. That discovery was made on June 13, 2004, in other words, 3 months after the attacks. This second vehicle allowed the strengthening of the argument that the 7 or 8 terrorists arrived in Alcala by car and it also bore traces of DNA from one of those killed in Leganés. Nevertheless, many observers doubt that a vehicle parked so close to the Kangoo van would have been able to go unnoticed for 3 months, even more so considering that its registration number is not even mentioned in records collected on March 11. That piece of evidence thus remained in limbo until June 2005 when police delivered the testimony of a Chilean prisoner to the investigative judge. This man claimed to have stolen the Skoda and subsequently to have sold it in October 2003 to one of those killed in Leganés. But this evidence was once again discredited in March 2006, when a journalist from El Mundo revealed the testimony of a security guard in a suburb of Madrid where the Skoda was abandoned in November 2003. According to this new witness, the vehicle was improperly parked for 3 weeks and received numerous parking violations, until it disappeared. By verifying that testimony through the records of the parking violations, it was discovered that the Skoda had been involved in various crimes such as street robberies. These crimes were committed between September and October 2003, a period during which the car was supposedly in possession of the Chilean. But until then the police, as well as the Chilean, had totally concealed those facts from the investigative judge. When he tried again to examine the South American prisoner, the judge learned that he had been extradited to Chile without anyone having notified him of the fact. To all these contradictions must be added the inconsistency of the behavior of the terrorists. To commit one of the worst attacks that has ever been seen in Europe they were unable to come up with anything better than to use a stolen car, involved in a whole series of crimes, which had been abandoned in the street for a time, which had various parking violations, and on which it did not even occur to them to change the license plates. The court therefore had no choice but to remove the Skoda from the list of elements of proof in its verdict . Moreover, the DNA found on that likely fabricated evidence raises doubts as to the traces of DNA found on clothing so “conveniently” abandoned by the suspects in this case. Take, finally, some examples of suspected falsification of testimony. Emilio Trashorras confirmed that police had asked him to invent the episode according to which it was he who provided the explosives to El Chino . This witness thought he would enjoy the status of protected witness and that he would have no more problems with the law. For his part, the witness Hassan Serroukh told the investigative judge that his statement to police had been falsified. That testimony described Zougam as a religious fanatic, something that Serroukh claims he never said . Acts of negligence and suspected fabrications are among the many suspicious police actions that appear in the investigation which followed the attack. But suspicions are heightened even further upon examining the preparations for the attack as presented in the verdict. Two key players in the attack were informants for the security forces . The first, Zouhier, put the terrorist cell in contact with an explosives trafficker. The investigation revealed that the Civil Guard, which controlled this informant, called him two days before the attack. The second, Trashorras, is nothing less than the actual explosives trafficker. He had several telephone conversations with his police contact the day before, the day after and two days after having placed the explosives in the hands of El Chino. But that police contact maintains Trashorras told him nothing about that fact. In addition, the mobile phones used in the manufacture of the bombs were unlocked at a location belonging to a policeman of Syrian origin, Maussili Kalaji . What a coincidence that all these terrorist collaborators have been linked to the police! And above all, what “luck” that none of them were turned in by these police before they committed the crime. Apparently, the terrorists also were lucky in terms of the surveillance they were subjected to by the police. As recorded in police records, since January 2003 the police had been closely monitoring an Islamist group which included several of the terrorists who would later die in Leganés. In sum, this group was regularly under surveillance on 81 days spread between January 2003 and February 2004. This monitoring appears to have intensified during the first half of February 2004, but ceased abruptly on February 17, that is, eleven days before the operation to deliver the explosives, and twenty-four days before the attack itself . The same good luck will later accompany the two accomplices of the terrorist cell whose telephone conversations were being intercepted in the course of an investigation into drug trafficking. The phone taps were suspended abruptly on March 12, the day after the attack . Let’s consider the first example in which the silhouette of the police is visible behind the terrorists. After the explosion of the apartment in Leganés, several documents regarding ETA appear among the ruins. It was determined after the fact that these documents came from the neighboring apartment, which was partly destroyed. That other apartment was occupied by a policeman who – one more coincidence – specialized in fighting terrorism . All these suspicious behaviors, before and after the attack, linked to the obvious inconsistency of the Islamist theory, suggest that the real culprits were under the protection of the state apparatus. It must be emphasized, however, that only a reopening of the investigation can determine whether those suspicions are founded. By revealing evidence that shatters the official version and absolves the alleged organizers, the trial has done nothing more than confirm the extreme fragility of the theory of an Islamist attack. In any case, in the political context, the court did not attempt to precisely establish the facts. It had to conclude that José María Aznar’s accusations against ETA were unfounded, as had already been decided by the broadest of juries, the voters. At the same time, the court had to conclude that the accusations by neo-cons against al Qaeda were also unfounded, something which the new government of Jose Luis Zapatero had already decided. The court determined that the initial evidences had been fabricated to falsely accuse the Basque organization ETA, but declined to go further in terms of the manipulations carried out by certain elements of the police. The court chose, not surprisingly, to content itself with the hypothesis with which it had been presented and which was the only one that could restore social calm: the hypothesis of Islamist responsibility without links to al Qaeda. Translated from Spanish to English by DAVID BROOKBANK. See one of the few French articles that mention the position of the Spanish newspaper El Mundo : ’Espagne – Madrid attentats: enjeu politique du procès’ (Spain – Madrid attacks: the political stakes in the trial) Latinreporters.com, 13 February 2007. This article does not address, however, the discussion of the evidence. Both commentaries (in Spanish) (Las Sombras del 11-M and 11-M: 1000 Dias Después), which are very interesting as a first exposure to the work of Luis del Pino, appear on this web page of the group seeking the re-opening of the investigation. The presentation of evidence in the verdict (2007) is laid out in Hechos Probados (Proven Facts; pages 172 to 228) and Fundamentos Juridicos (Legal Fundamentals; pages 423 to 722). The legal argumentation is available, in French, at the blog of Jean Chalvidant, author of La Manipulation: Madrid, 11 mars, the primary book on the attack published in French. “La fiscal prescinde del testigo clave de la custodia de la mochila de Vallecas” (Prosecutor ignores key witness on custody of Vallecas backpack), El Mundo, March 21, 2007. Los enigmas del 11M (The enigmas of March 11), by Luis del Pino (LibrosLibres, 2006), Chapter 24, “Llamame”” (Call me). Los enigmas del 11M (The enigmas of March 11), by Luis del Pino (LibrosLibres 2006), Chapter 21, “Déjà vu” (In French in the text). “La Sentencia del 11M. La autoría material (II) (The Sentence of March 11: The Material Author (II)), by Lucia Velasco, Asturias Liberal, September 1, 2008. Las enigmas del M11 (The enigmas of March 11), by Luis del Pino (LibrosLibres, 2006), Chapter 20 “La busca (The Search), paragraph “¿Cómo llegó la Policía al piso de Leganés?” (How did the police arrive at the Leganés apartment?). Testimony of Abdelkader Kounjaa, April 9, 2007. The witness stated 3 times that he did not recognize the voice of his brother. We see here: “the voice that was … I had doubt about whether it was the voice of my brother. And I asked him: who is this? And he said to me: It’s Abdulá. And I responded: Who is Abdulá? And he said, I am Abdulá. And I said: Who is Abdulá? Your brother.” (la voz que tenía… que tenía duda como no si fuera mi hermano. Y le digo : ¿quién es ? Y me dice : Soy Abdulá. Y le digo : ¿quién es Abdulá ? Tu hermano.). It is important to point out that by completely overlooking the doubts expressed in this testimony, the verdict pushes the inconsistency to the extreme of citing this testimony as proof of the authenticity of the goodbye phone calls (pages 568-569). Los enigmas del 11M (The enigmas of March 11), by Luis del Pino (LibrosLibres, 2006), Chapter 26 Las llamadas de Leganés (The Leganés calls). Los enigmas del 11M (The enigmas of March 11), by Luis del Pino (LibrosLibres, 2006), Chapter 12 El cuento de El Chino“, paragraph “A industrious terrorist”. Testimony of telephony experts, May 21, 2007. Question from Zougam’s defense attorney: “Could you indicate exactly in which volume of this report can be found the information that allows you to state that these 7 cards had been activated in Morata?” (Podrían indicar ustedes exactamente en qué folio de este informe se encuentra el dato que les permite afirmar que se encendieron esas 7 tarjetas en Morata ?) The experts failed to provide a concrete answer to this question. See Appeal Verdict (2008), page 7, Op. cit. Los enigmas del 11M (The enigmas of March 11), by Luis del Pino (LibrosLibres, 2006), Chapter 5 “Las miguitas de Pulgarcito” (Tom Thumb’s crumbs), paragraph “La furgoneta de Alcala” (The Alcalá van). Les Dessous du Terrorisme (The behind the scenes of terrorism), by Gerhard Wisnewski, editorial Demi-lune (2007), pages 23 to 28. La nitroglicerina no ha venido volando (The nitroclycerin did not come flying), El Mundo, June 4, 2007, interview with one of the experts by Antonio Rubio. The expert: “When a chemist analyzes anything, he makes a solution that is passed through measurement devices and the results are saved. In this case they were not saved.” (Cuando un químico analiza cualquier asunto, hace una disolución que pasa por unos equipos de medidas y lo que procede es reservarla. Pues aquí no estaban reservadas). Indictment, page 53: Statement by the chief of bomb disposal specialists in Madrid: “It was clearly not Titadine because this type of explosive bites, meaning it does not cut cleanly, while on the other hand a high explosive cuts completely and, once the results of the explosion are seen, it could be C3 or C4.” (Tenían claro que no era Titadine porque este tipo de explosivo muerde, es decir, que no tiene corte limpio, en cambio un alto explosivo corta totalmente y una vez visto los resultados de las explosiones podía tratarse de un C3 o un C4). Indictment, starting on page 78. Los enigmas del 11M (The enigmas of March 11) by Luis del Pino (LibrosLibres, 2006), Chapter 10 “El tiempo debe detenerse” (Time must stop), paragraph “Tirando el hilo” (Pulling the thread). Los enigmas del 11M (The enigmas of March 11), by Luis del Pino (LibrosLibres, 2006), Chapter 20 “La busca” (The search): Response of the police, May 20, 2005 – “In compliance with the request of the court … regarding the events which took place in the locality of Leganés on April 3 and 4 of last year, it is hereby notified that, given the time elapsed, the tape recordings of that incident were not kept.” (Dando cumplimiento a lo solicitado por ese Juzgado… respecto a los hechos ocurridos en la localidad de Leganés los días 3 y 4 de abril del pasado año, se participa que, dado el tiempo transcurrido, ya no se conservan las cintas de grabación de dicho suceso). Verdict, page 634: “The statements of Rabei Osman Sayed Ahmed, in which, according to the accusations, he takes credit for masterminding the attacks, stating that “the idea of Madrid was mine … it was my most cherished project, etc.” are clearly ambiguous.” (las conversaciones de Rabei Osman EL SAYED AHMED en las que, según las acusaciones, se atribuye la autoría intelectual de los atentados al decir que «el hilo de lo de Madrid fue mio…era mi proyecto más querido, etc.», son claramente equívocas]. And verdict, page 720: “WE MUST AND DO ACQUIT (…) Rabei Osman EL SAYED AHMED (…) of all crimes that he had been accused. “[DEBEMOS ABSOLVER Y ABSOLVEMOS A (…) Rabei Osman EL SAYED AHMED(…) de todos los delitos de que venía acusado). Los enigmas del 11M (The enigmas of March 11), by Luis del Pino (LibrosLibres, 2006), chapter 29, “El Chileno” (The Chilean). Trashorras: “La Policía me ofreció dinero para incriminar a Zougam y El Tunecino“ (Trashorras: ’The police offered me money to incriminate Zougam and The Tunisian, El Mundo, September 15, 2006, interview of Trashorras by Fernando Mugica. “I told the judge that Jamal Ahmidan, who I knew as ’Mowgli’, carried the explosives because the police told me to say it […]; I was threatened and coerced to testify that way.” (Yo le dije al juez que Jamal Ahmidan a quien conocía como ’Mowgli’, llevaba los explosivos porque así me lo pidió la Policía […]; fui amenazado y coaccionado para que declarase en ese sentido). Los enigmas del 11M (The enigmas of March 11), by Luis del Pino (LibroLibres, 2006), Chapter 9 Visperas de sangre (Vespers of blood), paragraph «Quinto enigma: llamadas de cortesía» (Fifth enigma: courtesy calls). Los enigmas del 11M (The enigmas of March 11), by Luis del Pino (LibrosLibres, 2006), Chapter 9 “Visperas de sangre” (Vespers of blood), paragraph “Cuarto enigma : el tiempo invertido” (Fourth enigma: the time invested). 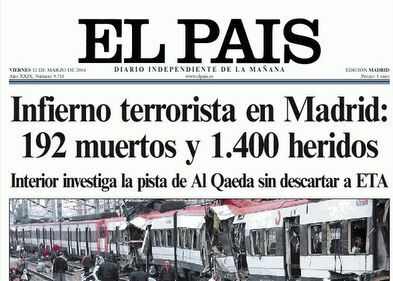 The 192 editorials that the daily El Mundo devoted to the attack.